A rather curious letter recently appeared in the Tulsa World Editorial page titled Wind Turbines, by Jim Wiegand, Redding, CA. Mr. Weigand has no ties to Tulsa, yet the editor published it and added a note: “Wiegand is a nationally recognized wildlife biologist and expert on the effects of wind turbines on birds.” The letter started with, “The wind industry is hiding massive turbine-related bird and bat genocide. The industry has created fraudulent mortality studies and been given voluntary guidelines in order to hide its slaughter.” The letter never mentioned birds again but went on into conspiracy theories and a criticism of wind energy. 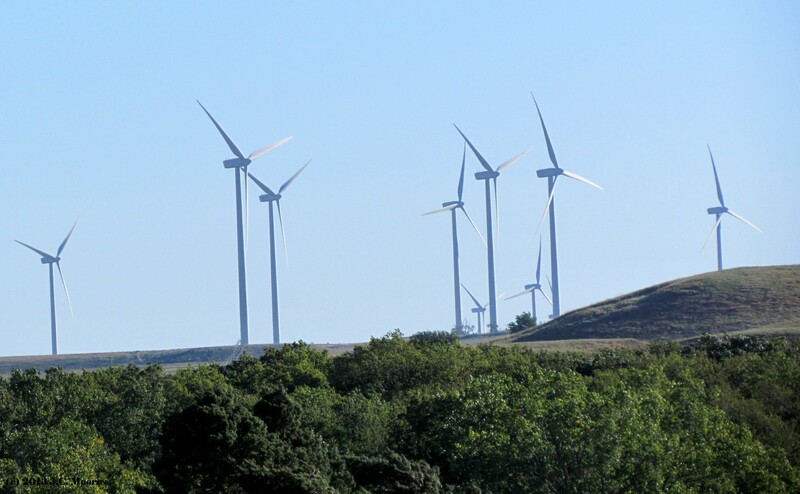 Wind-turbines do sometimes kill birds and bats, but bird genocide? In other of his writings, Mr. Wiegand claims windmills are responsible for dozens of Whooping Crane deaths, and that wind turbines will cause their extinction within five years. So far, there is not one Whooping Crane death that can be attributed to windmills. Carla Gilbert, in a post to the article, disputed the danger to similar birds. “When I was traveling in Portugal a number of years ago we could see many wind turbine farms from the highway. We were informed that the storks like to build their nests atop them. When the bus stopped for refueling I took pictures of the storks sitting on their nests atop the turbines and saw several storks coming and going from their nests. I did not see any injured or dead birds.” And, the storks are not becoming extinct as a result of the windmills. One falconer, who was at first worried about the windmills, now puts his falcon boxes on wind turbines and does not consider them a greater threat to birds than his picture window. There has been considerable opposition to windmills and of renewable energy in general, so it is difficult to know whether all the criticisms are factual. Studies have found about an average of five to eight dead birds per windmill. That is about the number of birds who do themselves in on a picture window each year. When you add in the birds killed by cars and by hunting, it would seem that man’s other activities are a greater threat to the birds than wind turbines. For birds, the main threats are windows, cars, climate change, disease, hunters and pesticides. The concern about prairie chickens* is that they avoid tall structures, and windmills might cause them to move from their normal habitat. Prairie chickens gather to mate each spring in large communal areas called leks. One enterprising oil company, opposed to wind power, drove a group of reporters up to a lek in the Osage Hills. They wanted to show the reporters what might be lost if windmills were built there, as if driving a van full of reporters around their lek is not going to disturb them. Many of the problems with wildlife and noise could be addressed by where the windmills are sited, and reasonable laws are needed to see that the windmills will disturb animals and people as little as possible. Mr. Wiegand’s letter is mostly fiction. A search shows that Mr. Weigand has a degree in biology from the 1970’s and makes his living by selling antiques. He has done nothing that would qualify him as an expert in wildlife biology, and none of his claims, here or elsewhere, are backed by credible research. His avocation is writing letters to newspapers and posting comments on websites critical of wind energy. Some people can’t see the value, or the beauty of windmills, and they look for any excuse to criticize them. Smoky Hills Wind Turbines Greet the Sun. 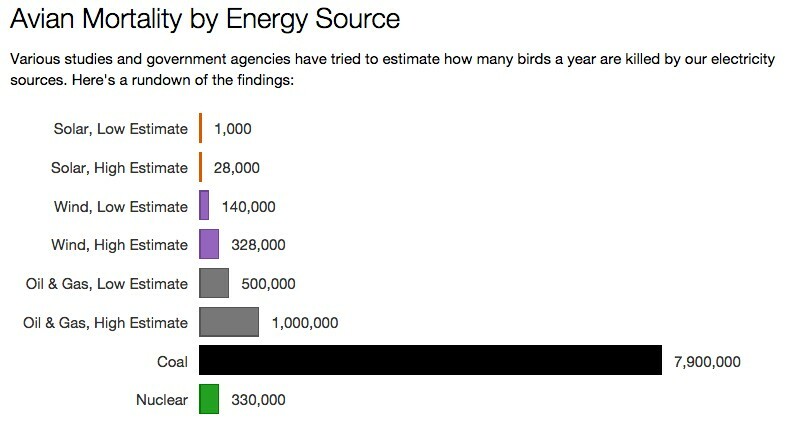 **Note added on 09/20/2015: Here is an estimate of the number of birds killed by each major energy source from US News and World Reports..
* Note added on 11/20/ 2017: Greater Prairie Chickens are little bothered by wind turbines, according to researchers at the University of Nebraska-Lincoln, who studied 91 nests near an existing wind farm near Ainsworth, Neb. The only negative impact was some avoidance by females of the turbine service roads. A similar study conducted by Kansas State University biologists at the Meridian Way Wind Farm near Concordia, Kan. Nest survival was not affected by proximity to wind turbines and female survival rates actually increased after the wind turbines were installed, possibly because the machines kept predators away from the nests. The Kansas researchers concluded that destructive range management practices were the real problem, having reduced grass cover needed by the birds. This entry was posted on Tuesday, January 7th, 2014 at 5:10 pm	and is filed under Energy and the Environment. You can follow any responses to this entry through the RSS 2.0 feed. You can leave a response, or trackback from your own site. Jim Wiegand is spot on. You obviously don’t live near wind mills or choose to ignore their genocide. I live in the Tehachapi Pass with thousands of that crap techology. The designers of the equipment didn’t have the brains to bother to cover the nearly 200 foot long blades or muffle the intense noise. There have been problems with bird deaths at Tehachapi Pass, but the research shows that overall other of man’s activities have a greater impact on bird mortality. Tehachapi Pass was one of the first wind farms, and some of the turbines have not benefited from more recent improvements. I can see you feel strongly about the issue and have experience with turbines. I have stood under wind turbines and the noise was less than that of the 30mph wind whistling through the fence and grass. Please describe how far you live from the wind farm, how long you have lived there, and how noisy they are, in dB if possible. There are plans to triple the size of the wind farm, and siting issues should be studied before that happens. Wind turbine generators stand on their own not to be compared to other causes of bird deaths. 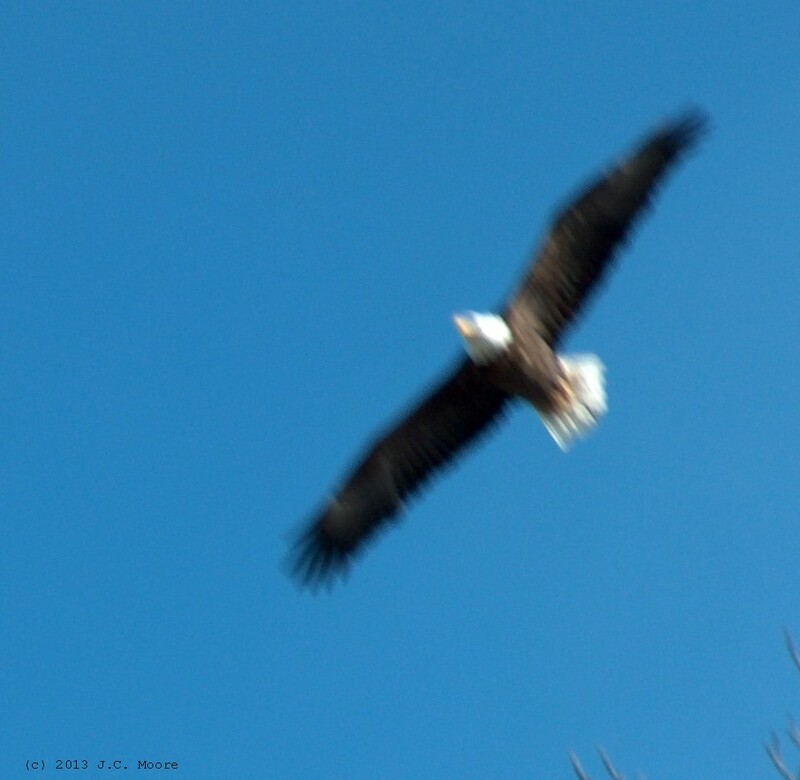 Have you ever heard of a cat killing Bald eagles, Golden eagles or California condors??? Turbine blades are deadly to raptors. 10-20 hawks are struck every single day around Silver Queen mine in Mojave. I’d say no other cause of death holds a candle to those numbers. My friend who is an animal control officer who specializes in pet cruelty cases was given the information right out of the bird picker’s own mouth. There is absolutely no rational reason for why those blades are in the open air without grills over them. This fix would end much of the opposition to them. Have you ever had a worker come to your home to fix something and while in the process breaks everything else? Drops a hammer on a hardwood floor putting a permanent dent in your floor, breaks a lamp or is just plain old idiot. This is the wind developers in a nutshell. Either the wind companies need to cover those blades or shut that garbage off until they do.